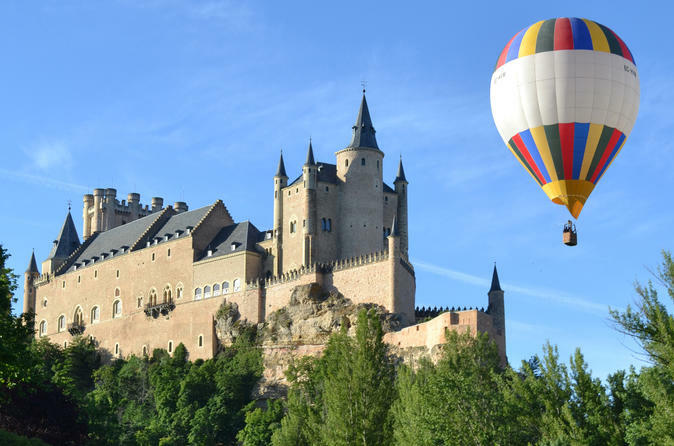 Your balloon experience starts early in the morning with a pick-up from your hotel in Madrid or alternatively meeting your guide directly at the launch site (depending on selected option). Once all of the travellers have checked in, you will receive a brief orientation from the local supplier's staff. As you listen to your guide you will have the opportunity to see the final stage of the balloons being inflated. And once everyone has been comfortably assisted into the baskets, it’s time to fly. The take-off will take place at sunrise when the winds are light and temperature is cool. Before you know it you will be peacefully floating over Toledo or Segovia taking in all views that these World Heritage cities can offer you, from the Alcazar of Toledo to the majestic Tajo river surrounding the municipality or the Segovia Aqueduct, one of the best-preserved works of Roman engineering. Once the ride comes to an end (1-hour flight), you will be landing. But the fun is definitely not over yet. You will be given the option to help the staff team de-inflate the balloon and as a celebration of this magnificent experience you will have a toast with Spanish Cava and a small brunch made with local products as you are given your flight certificate for you to remember this unique ballooning tour. Finish your tour being brought back to your Madrid hotel or the departure point (depending on selected option).